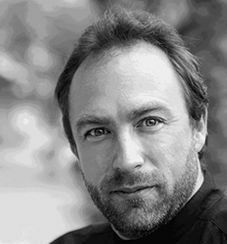 Jimmy Wales founded Wikipedia, a free Internet encyclopedia to which anyone can contribute. Also the world’s largest encyclopedia, it has become the fifth-largest website in the world and its popularity has helped fuel a trend of collaboration and sharing among users. In 2003, Wales founded the Wikimedia Foundation, a nonprofit dedicated to encouraging the growth, development and distribution of free, multilingual content, and to providing the full content of these projects to the public free of charge. Wales earned a bachelor’s degree in finance from Auburn University and a master’s at the University of Alabama. From 1994 to 2000, he was the research director at Chicago Options Associates, a futures and options trading firm in Chicago. He is a member of the Berkman Center for Internet & Society at Harvard Law School and serves on the boards of directors both of Socialtext, a provider of wiki technology to businesses, and of the nonprofit Creative Commons. He has received an honorary doctorate from Knox College of Illinois and was presented with a Pioneer Award from the Electronic Frontier Foundation in 2006. The World Economic Forum recognized Wales as one of the “Young Global Leaders” of 2007.